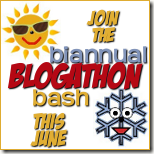 This is my first time participating in the Blogathon. This isn't a time where we blog continually, but instead try to get some updates done on our blog. A set aside weekend to get caught up is what I am using it for! I hope that the next one I will be a bit more knowledgeable and be able to participate more in some of the techy things, but for now I will take what I can! I have the summer to get caught up, and then plan on doing about half of my typical posts come this school year. It is not too late if you want to join in!! If you notice anything on my blog that needs updated, or have any suggestions for reviews or post be sure and let me know. Now is the time to be heard! I have a book blog as well. Nice to meet a fellow book blogger! Best of luck with your to-do list! I’m a Blogathoner as well. I’d love to connect with you! You can find my to-do list here: http://singlemommywarrior.com/biannual-blogathon-bash-kickoff/. I’d also love to connect with you on Facebook: www.facebook.com/singlemommywarrior. Good luck this weekend!